Vedalia beetles have been controlling cottony cushion sale for more than 100 years in California. They are extremely effective because they find small scale colonies quickly, reproduce rapidly, and are specific to cottony cushion scale. Their control of cottony cushion scale is superior to the standard organophosphate and carbamate insecticide treatments, because vedalia more completely control the cottony cushion scale populations, and because they do not disrupt natural enemies needed for control of other pests. The beetle is so effective that even small numbers (25 beetles/ac) will control cottony cushion scale populations in just 6 weeks. Soft scales, such as cottony cushion proliferate in shady, cool humid, unpruned tree interiors, whereas an airy canopy provides a habitat more conductive to citrus thrips. You must control the scale while the weather is still cool, as hot summer temperatures rapidly kills the vedalia beetle. About 40+- percent of the cotton cushion population have been found to now be immune to insecticides. Can these beetles be purchased? Vedalia beetle (ladybird beetle) can be purchased from places. Look up on the Internet under Vedalia, or Ladybird beetle. Insecticides, or as Mr. Texas writes, Dormant oil, can be used but with difficulty of control. Nurseries here sell ladybugs, but I've never seen the vedalia beetle. They are missing the hair the vedalia has on their backs. These are different, yes? Yes there are 100s of Ladybug varieties. The Vedalia was imported from Australia about 100 years ago to eliminate major Cotton Cushion scale California infestations. California growers rely on the beetle for control, so there must be sellers of these insects. Contact the county agent of your county and ask them for a supplier. If you can't find a supply you will have to use insecticides. I have been battling the same CCS infestation for years. I can control them but I cannot seem to eliminate them. If I spray it kills them but more come back within a couple weeks. My trees are in a greenhouse and CCS doesn’t live in this area so it’s not a reinfestation from outside. I have tried ladybugs three or four times and they did not help at all. The ladybugs sold online are NOT the famous vedalia beetles and do not seem to eat the scale. I have looked extensively for a mail order source of vedalia beetles and found none. If anybody knows one I would love to know. The best spray I have found is soapy water. I am using “dr bronners pure unscented castile soap” as it has no detergents. I tried dormant oil (Bonide) also but I believe I mixed it way too strongly as it completely defoliated my guava and injured some other trees. I have never had any issues with soap. This was when I was messing with hose-end sprayers. I’ve given up on hose end sprayers after trying three types and even customizing them. They just don’t seem to work. Spraying is such a chore for me that I am currently building a custom sprayer to make spraying the underside of leaves easier. I would gladly use any number of chemicals to eradicate this infestation. I am okay if it means not eating any fruit for some time. If anybody has suggestions I’d love to hear them. What pesticides are recommended for CCS? A couple strong doses of imidacloprid will probably get rid of them. They have 22% stuff on amazon. A spoonful of that mixed in several waterings will probably take care of any insects for a year. Bayer sells a "fruit and nut systemic" but its watered down .2% and you are supposed to dilute it even more. The 22% stuff is the nuclear option. Also with citrus, fertilizers with nitrogen really attract bugs with the new growth. Once my citrus trees are the size I want, I stop using nitrogen on them. It just causes excessive leaf flush and insect infestation. Thank you. I am going to order this right now. Lately I feel like I’m cultivating scale instead of fruit. I have the cotton scale on a couple citrus trees. One is really bad. Its only on the trees I fertilize. Citrus really suffer a lot from this bug and leaf miner and even aphids. If the trees are large just use a fert with way less nitrogen. Or go organic. One more thing, this systemic needs to be absorbed into the tree and takes time. It also absorbs faster in the hot season when the tree is using more water. The University of California at Riverside writes in their literature that the standard pesticide treatment against cottony cushion scale has been organophosphates and carbamate insecticides. They also go on to write, that all insecticide treatments are much less successful than Vedalia beetles. I'm surprised the bettle is so very difficult to purchase. Here in Colorado, luckily we do not have cottony cushion scale. 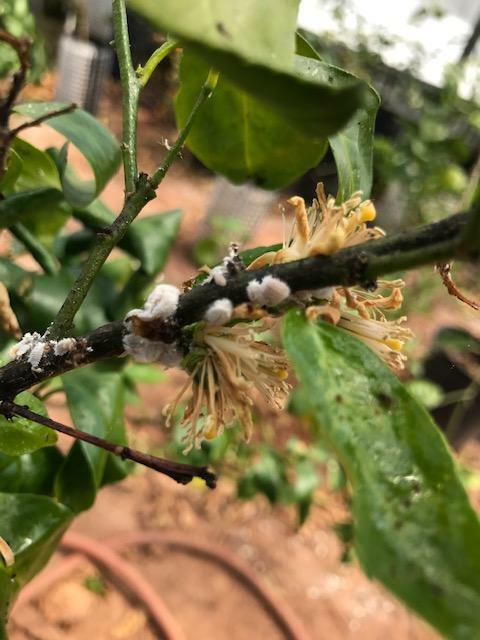 In California where Zephian lives, and writes this post, cotton cushion scale infest citrus during the months of January through May, and then again from October, November and December. Brian whatever you do to control your infestation, please follow up on this post with the outcome. Brian, I see some articles saying imidacloprid doesnt work on cotton scale so you may not want to try. It may be ineffective or it may need more concentration to work. I dont know, I know the Bayer stuff doesnt work well for aphids. But the 22% stuff does. Im going to give it a try on my tree in spring and see what happens. Ive tried oil and it doesnt work. Its too cold and too wet out now to try the systemic. Imidacloprid from Bayer seemed to control Citrus Leaf Minor last year for several months. Applied after flowering, the trees had 3 flushes without the CLM, but by August the systemic had worn off enough to allow the pest back in. My issue has been rust mites on my blood orange that really come on strong in September/October. Interestingly, the rust mites don't bother my satsumas even though they are planted a few feet away from the blood oranges. I hate to apply systemics any closer that 6 months from harvest so will have to be more diligent with a hort oil, neem and spinosad regimen. On the old forum Dr. Malcolm Manners stated that Imidacloprid does not enter into citrus flowers, therefore it does not enter into the fruit. I went out and sprayed the scale off my gold nugget today. Had to put three 50ft hoses together to reach it. Then go through every inch of the tree and blast em. Probably got 95% or more off. Going to keep doing it for a few weeks. Then when things warm up and ants come back will put a wrap with tanglefoot on it to keep ants away. I had scale on 3 tree's, don't know if this is the same kind of scale in the topic. I used my wife cleaner Shout by accident. sometime i use her empties. Left it on for a 1/2 hr and wash it of. I thought i am going to kill the tree. Guess, no more scale, never hurt the tree's. Shout probably works like a soap/detergent spray. It contains also a proteolytic enzyme. Ilya11 what reaction do you think the enzyme (there are at least 6 different protepytic emymes) has on the scale? In a product description booklet of SC Johnson ( a company that produce it) it is said to contain two non-ionic detergents and a subtilisin proteolytic enzyme. Could be a synergistic effect similar on its action to remove other materials of organic origin. Thanks Millet. I had heard that the Imidacloprid does don't get past the stem into the fruit yet we are warned to not apply during flowering so as not affect bees. Thus I am careful and apply systemics early so they have time to wear off. I ordered some imidacloprid 21%z, and sprayed soap one more time while I wait for it. If the scale reappears I will try the pesticide. Brian, wating to hear the out come if you use the 21%. I used isopropyl alcohol a while back and spot treated best I could, don't see any cotton scale. This is what I used on my oranges last spring and seems to have worked again. Will update if I see more soon. Haven't been in the yard much it's been cold and rainy. I hosed my infected tree off 3 or 4 times and its looking clean now. I had mealy bugs on an in ground pomegranate. I used a hose with an attached adjustable brass nozzle to wash them off the tree just as Spaugh wrote. I've applied imidacloprid at the highest listed rate, as a soil drench, to half of my trees. I removed any fruit from them first. The other half I will treat with only soap sprays. I'll let you know as soon as I'm back. I found some young adult CCS on one of the treated trees. I don't think it worked. However, the number of CCS I founds overall is far less than usual, so perhaps it is working somewhat, or hadn't been uptaken to the tips where these scale were found. I am going to treat the remaining plants and report back in another month. You will probably get better results if you use it during summer when your trees are using more water. Brian, are you unable to hose the tree off because of the greenhouse lacking drainage? Simply blasting them off with a hose seems to work the best. I noticed some more on my pomello. The never ending battle continues! We've finally go some nice weather so I'll be able to be much more attentive. I've also stripped the tree of all it's fruits so it should be easier to find now.